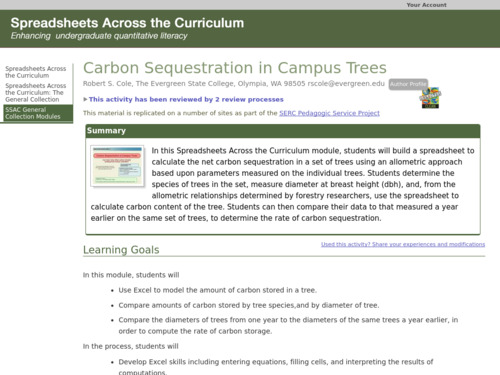 In this activity, students use a spreadsheet to calculate the net carbon sequestration in a set of trees; they will utilize an allometric approach based upon parameters measured on the individual trees. They determine the species of trees in the set, measure trunk diameter at a particular height, and use the spreadsheet to calculate carbon content of the tree using forestry research data. 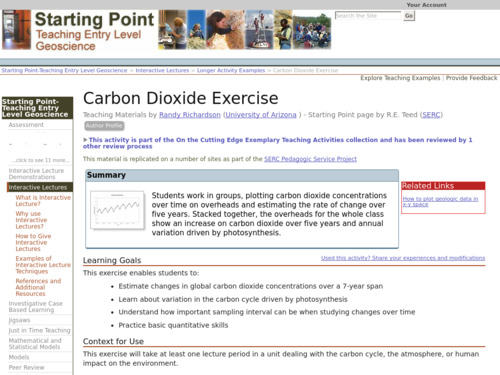 In this activity, students work in groups, plotting carbon dioxide concentrations over time on overheads and estimating the rate of change over five years. Stacked together, the overheads for the whole class show an increase on carbon dioxide over five years and annual variation driven by photosynthesis. This exercise enables students to practice basic quantitative skills and understand how important sampling intervals can be when studying changes over time. A goal is to see how small sample size may give incomplete picture of data. 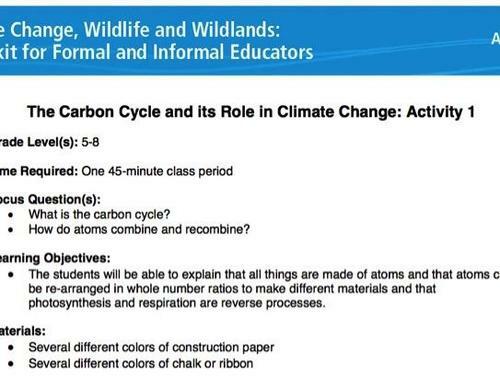 This series of activities is designed to introduce students to the role of sediments and sedimentary rocks in the global carbon cycle. 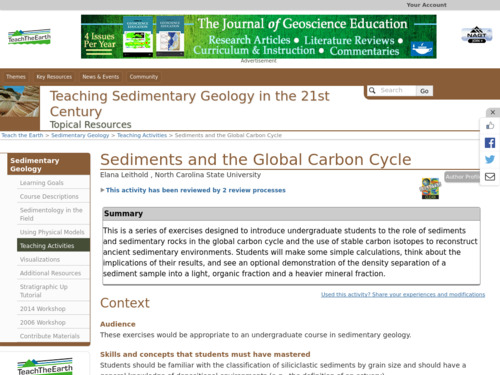 Students learn how stable carbon isotopes can be used to reconstruct ancient sedimentary environments. 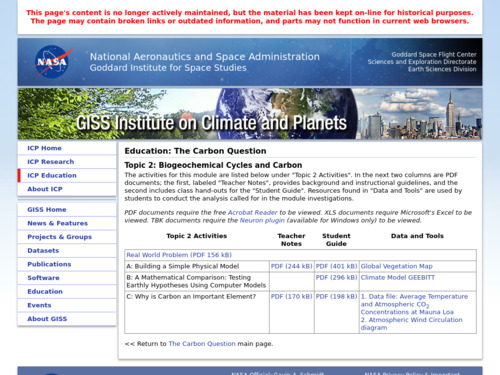 Students will make some simple calculations, formulate hypotheses, and think about the implications of their results. The activity includes an optional demonstration of the density separation of a sediment sample into a light, organic fraction and a heavier, mineral fraction. 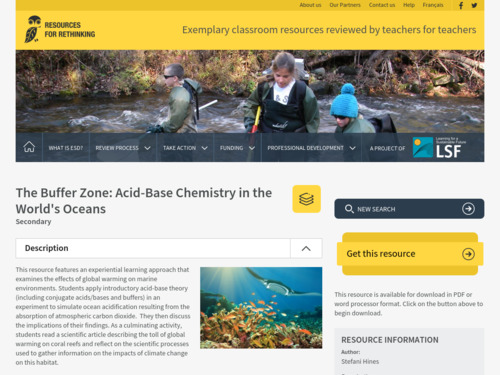 In this activity, students use datasets from both the Northern and Southern hemispheres to observe seasonal and hemispheric differences in changes to atmospheric C02 release and uptake over time. 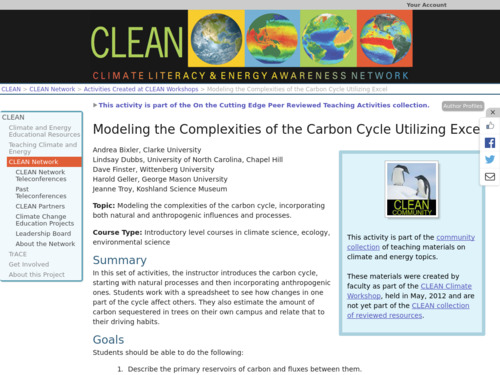 In this activity, students use a physical model to learn the basics of photosynthesis and respiration within the carbon cycle. 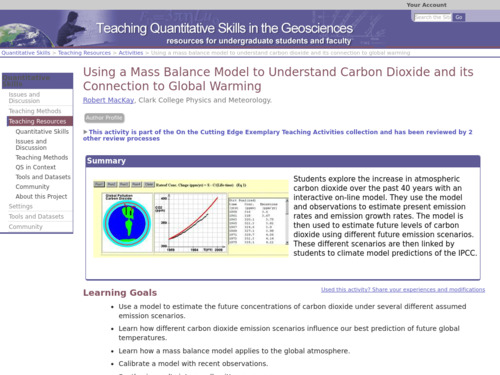 Students explore the carbon cycle and the relationship between atmospheric carbon dioxide concentrations and temperature. 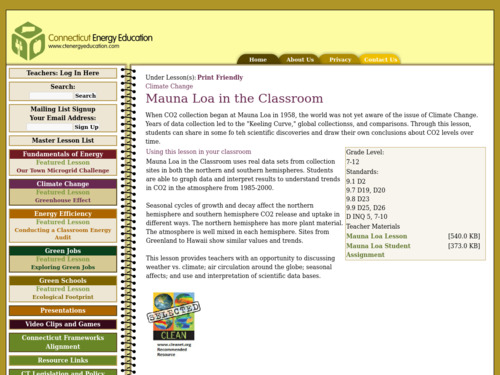 Students create and compare graphs of carbon dioxide and temperature data from one local (Mauna Loa, Hawaii) meteorological station and one NASA global data set. 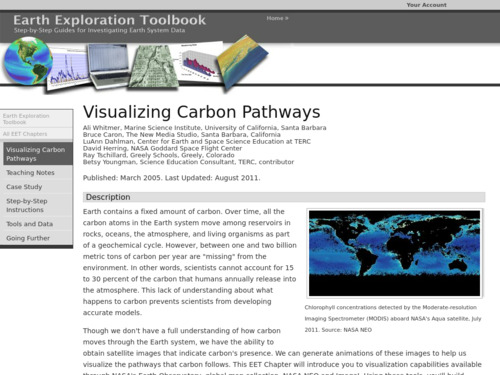 These graphs, as well as a global vegetation map and an atmospheric wind circulation patterns diagram, are used as evidence to support the scientific claims they develop through their analysis and interpretation.